With 2019 well and truly underway, Nintendo fans appear to be approaching each new week in the hopes of a new Nintendo Direct popping up and revealing a little more about the console’s future. And while last week’s Nintendo Switch Indie Highlights video may not have been exactly what they had expected it did feature a small handful of great looking titles. Even better still was the immediate release of 2D platformer slash beat ‘em up, Unruly Heroes – arguably 2019’s first pleasant surprise for the console. 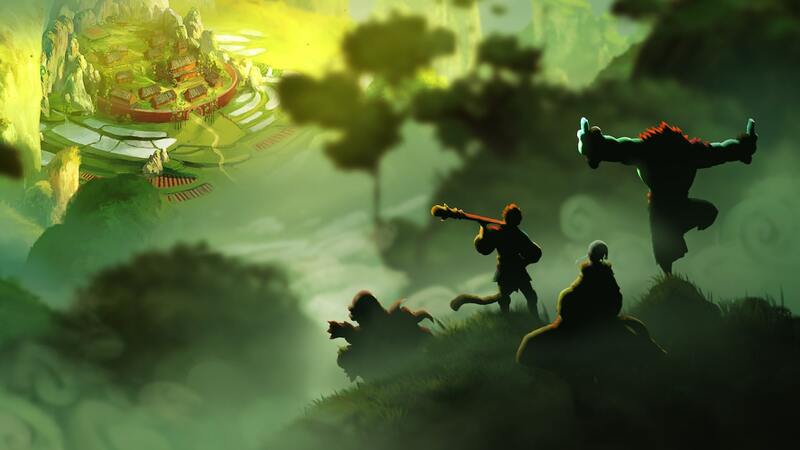 On first glance – and perhaps even a second or third – it’s easy to see more than a few similarities between Unruly Heroes and the more recent Rayman titles, be it the beautiful UbiArt-esque visuals or its comparable multiplayer platforming antics. It should come as no surprise then that the team responsible for the game – Magic Design Studios – consist of former Ubisoft veterans once responsible not just for the Rayman series but even the likes of Prince of Persia and Assassin’s Creed. And sure Unruly Heroes does feel somewhat familiar to the limbless hero’s more recent outings but that doesn’t stop it being any less fun. With the Switch currently spoilt for choice when it comes to platformers, standing out from the pack is a tough hurdle especially if you’re a new IP. Thankfully Unruly Heroes leaves such a strong impression thanks to its impressive blend of platforming, puzzles and satisfying combat. This isn’t merely a game about hopping and wall-jumping, quite the opposite in fact with brawls and moments that require a more thoughtful approach just as frequent an occurrence. Platforming feels a little looser than I’d like and lacks the precision of a Rayman or Mario title. In the early goings especially I’d find myself mistiming jumps, sloppily dashing into bottomless pits or struggling to get used to the lighter feeling of each character. It’s something you eventually get used to but still an area of the game that could have perhaps seen some tightening up. As for the combat, despite its focus on simplicity over complexity I actually had a great time with it. Enemies put up enough of a fight and can’t be taken down simply by bashing the buttons. You’ll need to make use of your dodging and dashing abilities, take advantage of the environment and wait for your opening. Puzzles meanwhile will pop up in various forms, some involving switches or the environment itself while others will require the unique abilities of your crew (more on that in a moment). Sure individually each of these elements may not be the best in class, but together they just seem to gel crafting a varied and fun experience. Then there are the game’s four main protagonists, each one capable of unleashing their own assortment of fighting combos as well as a unique ability, the latter key in progressing past certain sections of stages. Take my personal favorite Wukong for example, a Monkey King capable of double jumping and using his stick not just in combat but also to create a bridge across otherwise impassable areas. Kinhong the plump pig, on the other hand, possesses a single but higher jump and can even inflate like a balloon and float through the air. Despite it happening a fair bit in my playthrough, death rarely feels too punishing, the game allowing you to switch to one of your remaining teammates as well as the chance to revive them later simply by striking their spirit as it floats about the screen. If playing alone, you’ll be able to switch between the four characters on the fly, making solving puzzles feel fluid and rarely frustrating. Of course, bringing more human players into the mix means everyone gets to take on a unique role whilst also adding a little more chaos to the proceedings. Both are valid options each offering a rewarding and fun time each in their own right. The game’s main adventure mode consists of just shy of thirty levels, it’s narrative inspired by a 16th-century Chinese novel known as ‘A Journey to the West’. You’ll visit numerous worlds, each one throwing a range of challenging obstacles your way and plenty of creative boss battles. One moment you’ll find yourself riding a log down a river avoiding obstacles as you go, the next striking glowing blue orb-like plants to reveal hidden enemies and attack. It’s when the game ventures into puzzle territory though that you start to see even more unique and interesting ideas. One stage, for example, saw our crew possess a pack of wolves in order to infiltrate their camp. Not just a useful disguise, we were then tasked with commanding a fellow wolf comrade in the background of the stage hitting switches so we could press on forward in the foreground. The game consistently throws surprises your way at a healthy clip rarely repeating its ideas. There are a decent number of collectibles to find within each level – coins and scrolls – awarding the player with artwork and palette swaps for the four heroes. Medals are also handed out based on your overall performance though, more often than not, we found ourselves presented with the default bronze. As much fun as we had making our way through the game’s adventure, the desire to revisit past stages in the hopes of gathering some stray coins or obtain the allusive emerald rank never felt strong enough. Instead, we were perfectly content simply bouncing onto the next level and never looking back. Interestingly Unruly Heroes also includes a competitive multiplayer option, the approach taking on an almost Super Smash Bros. style albeit with a health bar. It’s entertaining sure but with limited mode types and stages, it’s a short distraction rather than something to return to over and over. There’s not much more to be said about the ‘painting come to life’ visuals of Unruly Heroes besides the fact they look truly beautiful whether playing in docked or handheld mode. Everything from the lush and detailed environments you explore to the smoothly animated characters themselves shines. The music too feels like a great fit considering the game’s source material although the voice acting tends to be more of a mixed bag. Unruly Heroes is a wonderfully enthralling adventure thanks to its striking visuals, impressive variety and clever mix of platforming, puzzles, and combat. What might at first seem like a fairly ordinary platformer reveals itself to be much more not only helping it stand out from an already crowded genre on Switch but surprise players in a great way.